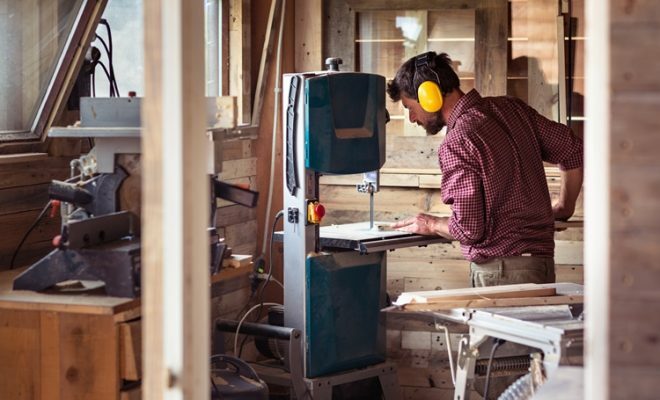 Are you looking for the best scroll saw? Do you want a versatile power tool which can create intricate designs on a number of different materials? If yes, then you’ve just landed at the right place. In the below-mentioned guide, we’ve prepared top 6 scroll saw reviews which you can purchase from today’s market. When a scroll saw is all about precision, all six of these models offer fewer vibrations which eventually results in an accurate design. Moreover, these scroll saws incorporate enough power to handle even the densest of materials in your workshop. So whether you’re a DIY user or even a professional woodworker, any one of these models can handle your cutting project. The DEWALT DW788 is ideal for all those woodworkers who’re looking to purchase a professional scroll saw. Offering a 20-inch cutting capacity, this product runs on a powerful 1.3AMP motor for your convenience. Depending on the cutting project, you can adjust its speed electronically with the help of a separate speed control. Furthermore, this scroll saw comes with a convenient on-off switch which makes it easy to turn on/off this saw without any hindrance. As already mentioned, the DEWALT DW788 features an electronic speed control. Starting from 400 strokes-per-minute, you can adjust its speed up to 1750 SPM for ensuring an efficient performance. This particular feature allows you to adjust the blade speed as per the material under consideration. In addition, if you’re going to work on a single material for a good few hours, you can work with low speed to prevent any kind of overheating. For ensuring improved visibility, the DEWALT DW788 comes with a flexible dust blower. As evident from its name, the blower makes use of air to clean your workspace from any kind of dirt. Not only it will improve the working conditions, but at the same time, it will also help you in making precise cuts. When it comes to working with the DEWALT DW788, you don’t have to worry about dealing with the vibrations. Basically, this product makes use of a double parallel-link arm design which is more than capable of reducing the vibrations to a minimum level. For added flexibility, you can move the top arm from back to front or vice versa. Such kind of construction makes it easy to handle materials of various depths as the adjustable arm allows optimal control to the owner of this unit. Lastly, this model comes with an integrated cast-iron table which allows you to make 0-45 degrees bevel cuts on both left and right side of the table. If you’re looking to purchase the best scroll saw, one which can be used on a wide range of cutting applications, the DEWALT DW788 can be your best bet. Featuring an electronic speed control, this product boasts a decent cutting capacity along with a durable construction. The Shop Fox W1713 is ideal for all those woodworkers who’ve to work with a number of different materials. 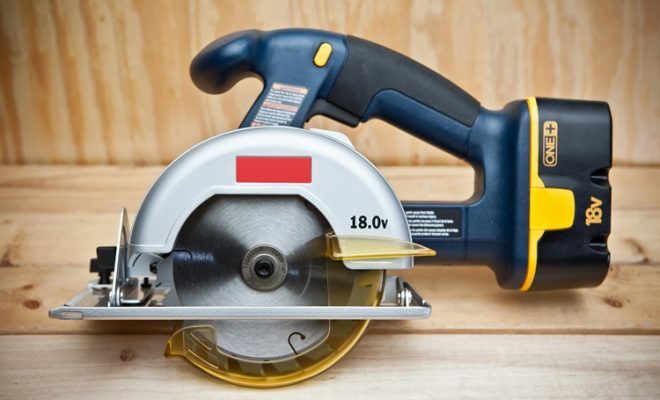 Featuring a 1.2 AMP motor, this product features enough cutting capacity to rip through wood, plastic or even metal. It comes with a variable speed control which allows you to adjust the blade speed from 550-1700 SPM. Furthermore, this product features a 16-inch maximum cutting width which makes it the best scroll saw 2019 for various cutting projects. For all those woodworkers who’ve to work round the clock, the Shop Fox W1713 incorporates a gooseneck work lamp. This is basically a bulb which is further connected to a light fixture. Depending on the exact place where you want to shine a light, you can adjust this bulb’s position without any hindrance. So whether you’re working late at night or even if you want to ensure precise cutouts, you’ll enjoy better visibility with the help of this light fixture. The Shop Fox W1713 is quite a versatile scroll saw which is compatible with both plain as well as pin-end blades. Such kind of construction allows you to choose the right blade for every type of project. In addition, changing the blade is quite easy as you just have to use the adapters which come included in this purchase. At a time when a majority of scroll saws are content on working with a dust blower alone, the Shop Fox W1713 combines a dust blower with a dust port for ensuring superior dust collection. When the former clears your workspace from any kind of dirt, the latter will prevent the accumulation of dirt even underneath your table. You just have to connect the 1 ¼’’ dust port with a regular vacuum and it will provide you with a healthy workplace environment. 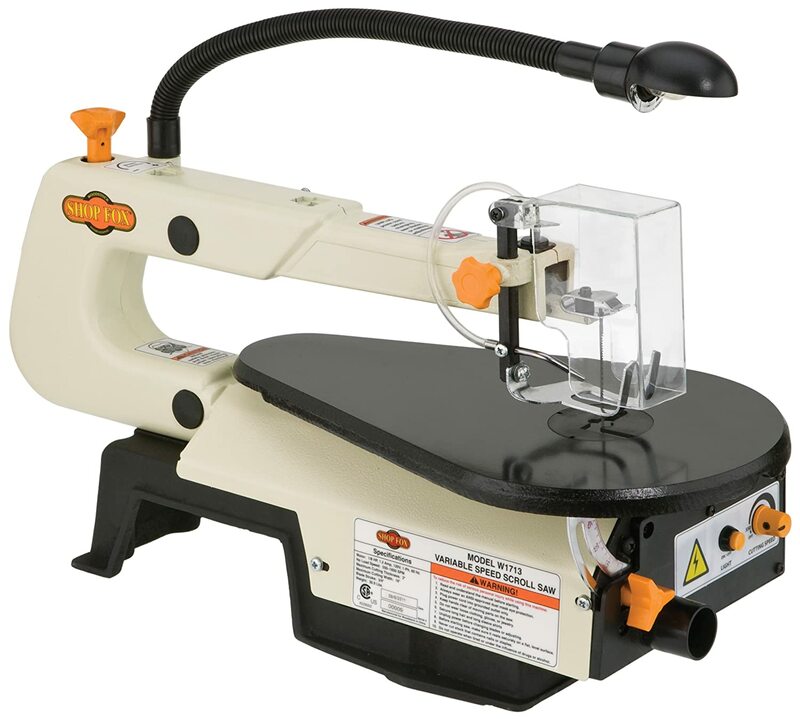 If you’re looking to purchase a small scroll saw, the Shop Fox W1713 can be your ideal purchase. Weighing in at 31lbs, this is one of the lightest scroll saws in today’s market. Despite its lightweight construction, it still comes with a decent cutting capacity along with a variable speed control. So whether you’re a DIY worker or even a serious woodworker, you can purchase this tool without any second thought. The WEN 3920 is designed for all those of you who’re looking to purchase a basic cutting tool. Available at an affordable price, this product sill comes with a handful of features for a budget-oriented purchase. First of all, you can use this tool for making angled cuts as it comes with a decent beveling capacity on its left side. Furthermore, this saw can cut in two different directions and with an LED work light, you can use this saw for handling small to medium sized projects in your workshop. For ensuring an optimal performance, the manufacturer has designed the WEN 3920 with a variable speed control. A separate speed adjustment knob is provided at the front side of this unit as you just have to turn it to attain your desired speed. Starting from 400 strokes-per-minute, this saw can work at a blade speed of 1600 SPM. The WEN 3920 uses a flexible LED light for ensuring enhanced visibility. Depending on the shape and size of the material, you can adjust the light’s position for making sure that it is illuminating just the perfect position. Apart from increasing your visibility, it will also enhance the accuracy of your cutouts. 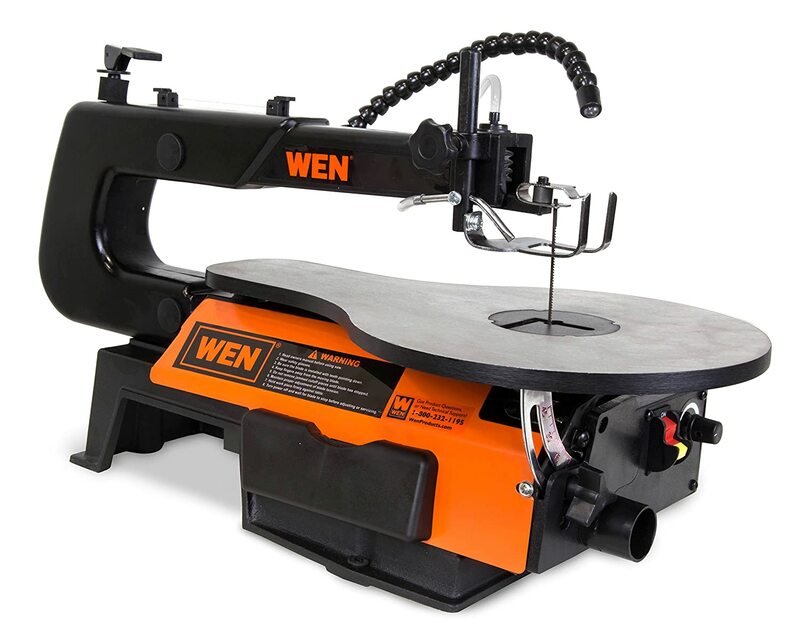 The WEN 3920 is basically a tabletop scroll saw which comes with a lightweight construction. The overall weight of this saw is just under 28lbs which makes it easier to transport from one place to the other. This tabletop comes with a 45-degree beveling capacity. For adjusting the bevel capacity, a lever is provided on the bottom of this unit. You just have to release the lever before tilting the table at your desired position. Also included in this saw is an air pump along with a dust port, both of which combines to make your workspace dust-free. One thing which we found pretty impressive in this purchase is that it comes with a clamp. Depending on the size of the material, you can move the clamp up and down. This clamp comes handy for keeping the material in place which eventually reduces vibrations to a certain extent. If you’re looking to purchase a cheap scroll saw, the WEN 3920 is worth a try. Despite its low price tag, it still comes with a wide range of hi-tech features, including a decent beveling capacity along with a variable speed control. The Delta Power Tools 40-694 is ideal for all those woodworkers who can afford to pay big bucks in return of the best scroll saw. Incorporating a staggering 20-inch cut capacity, this saw runs on a powerful 1.3AMP Motor. You can adjust the speed of this saw and for clearing your line of sight, it also comes with a built-in dust blower. Furthermore, the manufacturer is offering this product at a whopping 5-year warranty which is much better than any other product in today’s market. When it comes to the Delta Power Tools 40-694, it works with the pinless blades. As compared to the other type of blade, pinless is normally the first choice of a vast majority of woodworkers. Furthermore, it is very easy to replace the blade as you can do it in a matter of few seconds. There is no need for additional screwdrivers as all you’ve to do is to make use of the clamps which come included in this purchase. On making this purchase, you’ll get a couple of straight blades apart from the Delta Power Tools 40-694 scroll saw. The manufacturer has further provided an on-tool blade storage mechanism which ensures optimal protection for your valuable tools. 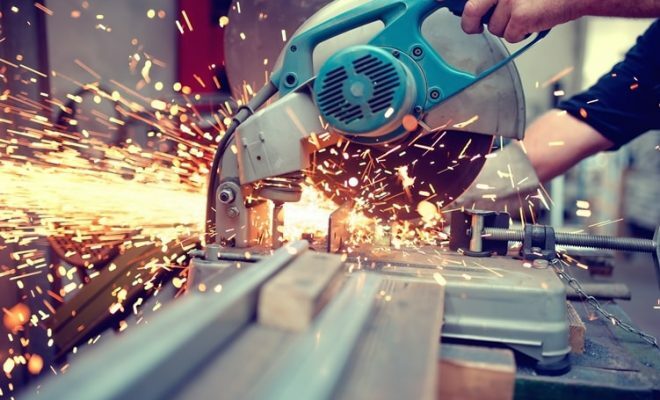 If you’ve used scroll saws in the past, you might be aware of the fact that how important it is for this machine to remain stable at various speeds. When it makes it easy to cut, you can also wrap up your work in a very short span of time. 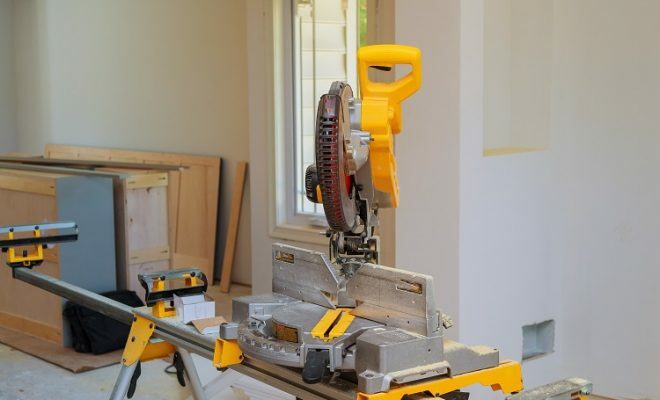 Keeping this thing in mind, the manufacturer has made use of a dual parallel-link arm design in the construction of the Delta Power Tools 40-694. Apart from reducing vibrations, it makes sure that this saw produces minimal noise as compared to any other cheap scroll saw. So regardless of the intricacy of your cuts, you can use this unit without any hindrance. 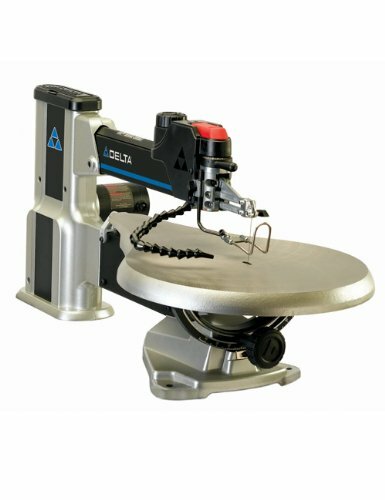 If you want the best scroll saw, one which can be used for years to come, the Delta Power Tools 40-694 can be your ideal purchase. This product boasts an optimal fusion of precision, control, and versatility and when it is very easy to use, this scroll saw can be used by anyone who has to make complex cuts on a number of different materials. The Porter-Cable 18″ Variable Speed Scroll saw is ideal for all those woodworkers who’re looking for a versatile cutting tool. Having a separate on/off switch, which is provided on the front side of this unit, this model comes with a flexible LED lamp. Also included in this purchase is a variable speed control and when it also comes with a work table, you can use this tabletop scroll saw for small to medium-sized cutting projects. 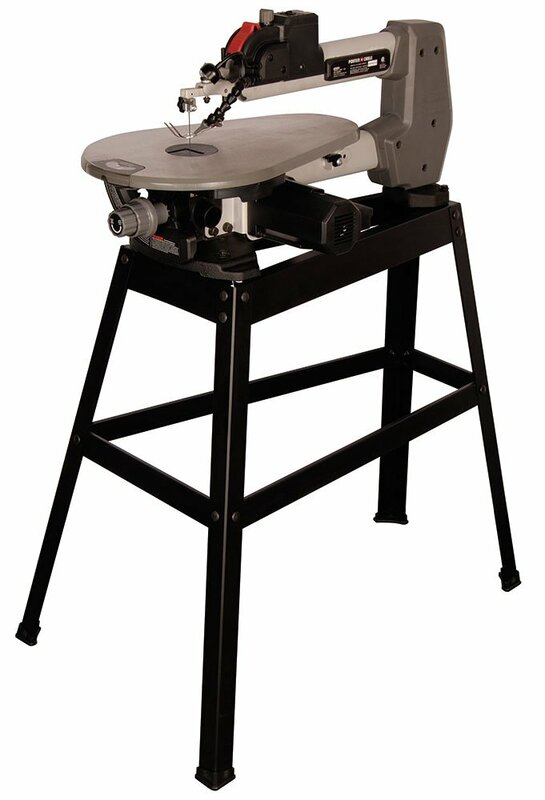 The Porter-Cable 18″ Variable Speed Scroll saw incorporates a variable speed control mechanism. This is basically a knob which is designed at the top of this unit. Depending on your cutting project, you can adjust it to attain a speed anywhere in between 500 to 1500 SFM. When the low speed is ideal for handling delicate materials, the higher ones come handy for cutting through thick materials. For making it easy to handle materials of various thicknesses, the Porter-Cable 18″ Variable Speed Scroll Saw comes with a dual tilt table. This table is made of Aluminum which means that regardless of the intense usage on your job site, you can use it for a long duration of time. Furthermore, you can tilt this table on either side. It comes with a 45-degree tilt capacity on the right side and a 15 degree capacity on its left side. You can adjust the angle, on which you want to make a cut, with the help of a bevel scale which is designed on the front side of this saw. The Porter-Cable 18″ Variable Speed Scroll Saw comes with two different features for ensuring flawless dust collection. First of all, you can use the built-in dust blower for keeping your line of sight clear from any kind of debris. The blower is adjustable which means you can easily move it from one point to the other. Secondly, a dust extraction port is designed on the underneath of this unit. You just have to connect it to a separate vacuum hose and it will clean your workspace. However, you’ve to purchase the vacuum hose on your own as it isn’t provided with this purchase. The Porter-Cable 18″ Variable Speed Scroll saw gives you a good value for your money. Having a variable speed control, this model can be used on a number of different materials, including wood, plastic or even aluminum, without any hindrance. It is a user-friendly equipment and when it also comes with a flexible LED lamp, you can use this saw round the clock. The Dremel MS20-01 scroll saw is ideal for all those woodworkers who’re running a tight ship. One of the least expensive products in its category, this model is designed for hobbyists and other DIY users who want to have a good value for their money. For all such customers, it comes with a decent capacity which is more than enough for cutting low-density materials. Starting from wood, you can use it on plywood, plastic and other such materials which are no more than ¾’’ in thickness. Additionally, this model can work with 4 different blade types which eventually makes it quite a versatile cutting tool. The Dremel MS20-01 is a 2-in-1 cutting tool. Apart from using it as a scroll saw, you can also use this model as a mobile coping saw. Just press a single button before removing the base of this unit. Afterward, you can use it as an ordinary handheld saw. Another thing which we found quite impressive in this purchase is that the manufacturer is providing 4 different types of the blade with this unit. It consists of a side cutting blade, wooden blade, fine wood blade and finally, a metal blade. So even if you’re going to use this model for various projects, you don’t have to purchase a new blade for a long time. The overall weight of the Dremel MS20-01 is just under 5lbs. As compared to any other scroll saw reviews in the market, this is one of the lightest cutting tools by a long margin. Such kind of construction makes it a viable product for all those woodworkers who’re using this tool for the very first time. 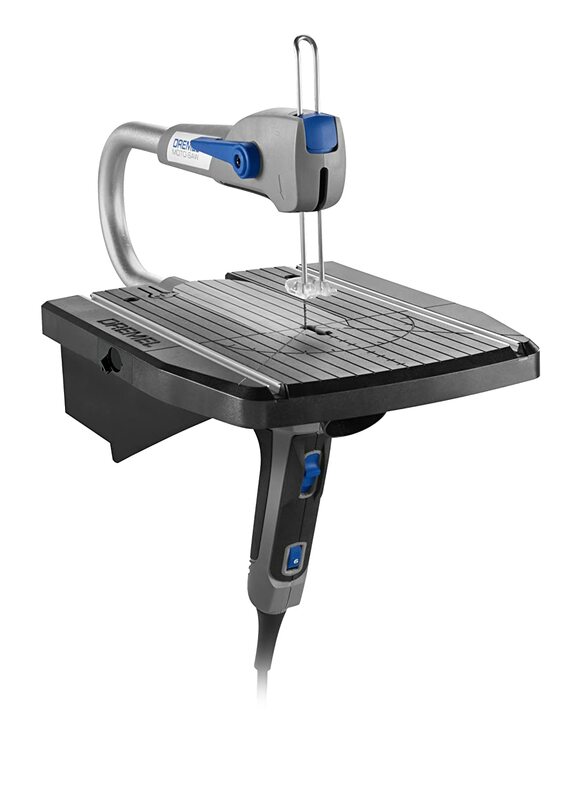 The Dremel MS20-01 comes with a sturdy base which can be attached to a series of table tops. The manufacturer has provided a couple of clamps for this purpose and once fully attached, the clamp base has the ability to reduce vibrations to a certain extent. The base is made of plastic and it comes with a decent surface area for handling low-density materials. One thing which customers have to keep in mind that the clamp base cannot be screwed to a bench top. It means even after you’ve clamped it in place, you might still have to deal with the vibration issues on using this small scroll saw. If you’re looking to purchase a decent entry-level scroll saw, there aren’t much better products than the Dremel MS20-01 in today’s market. Incorporating a lightweight construction, this model is extremely easy to use even for the novice woodworkers. 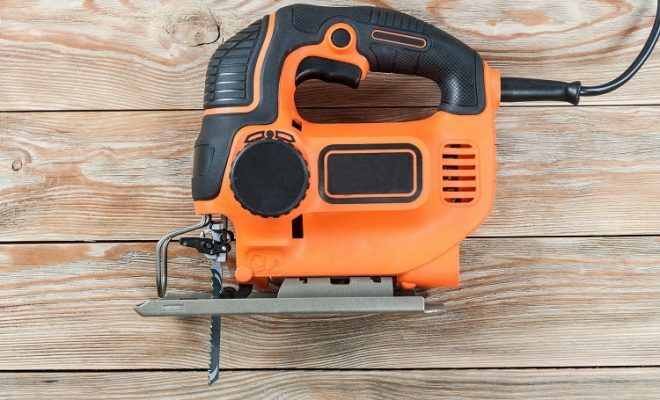 And when it also comes at a hard to beat the price, it makes it one of the best scroll saws 2019 which you can purchase within this price range. 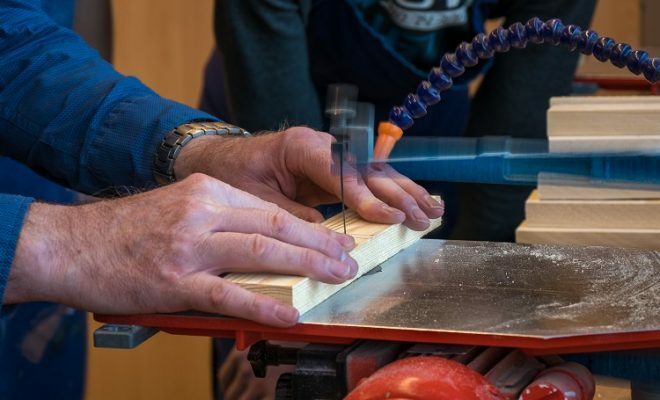 When it comes to using a scroll saw, you should attach it firmly to a tabletop, workbench or any other such surface. 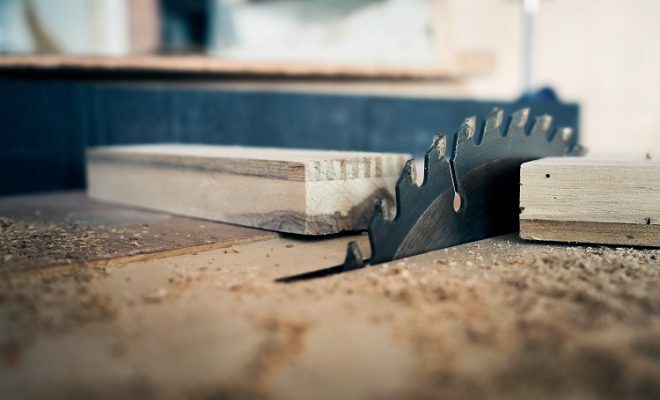 You should always turn off the saw while changing the blades and depending on your cutting project, always use a blade which is specifically designed for that purpose.